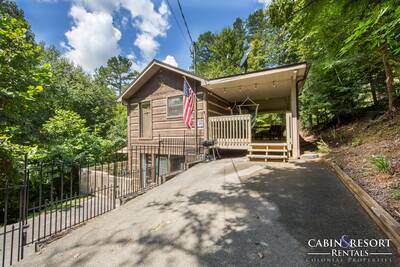 Welcome to Cabin T in the Smoky Mountains! 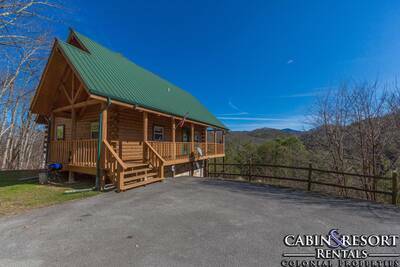 This awesome 2 bedroom, 2.5 bath cabin rental is definitely the place to spend your next vacation adventure! 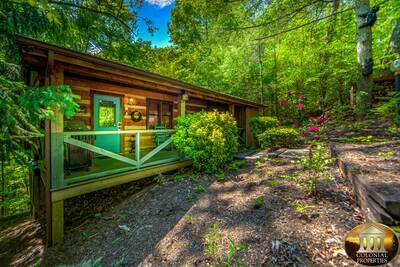 Cabin T offers a serene and private setting to enjoy everything you love about being in the Great Smoky Mountains! 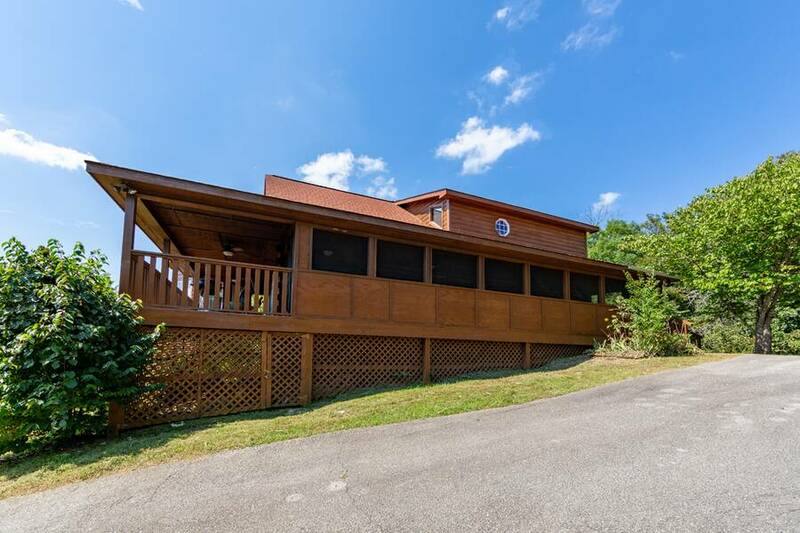 With one of the most fantastic views of the countryside and into the Smokies, you’ll love your stay at this cabin vacation rental. 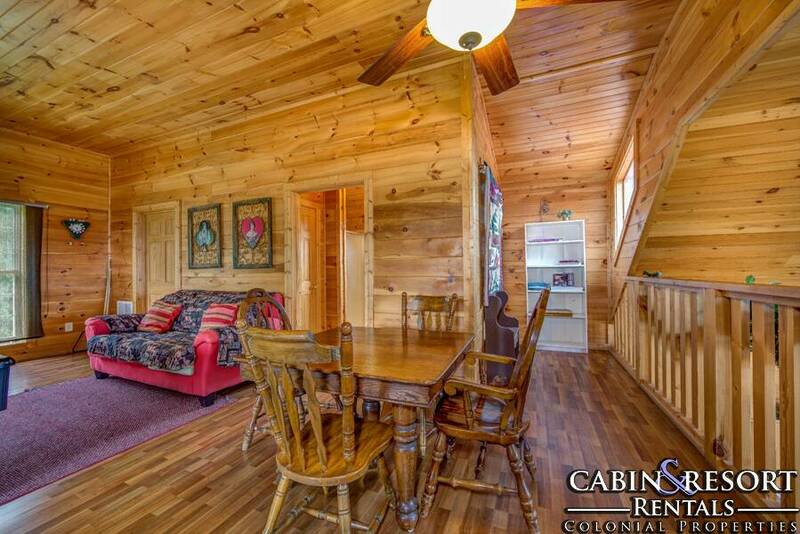 As soon as you enter this beautiful log cabin, you’ll be greeted by the gleaming all natural wood interior. With it’s open, bright and airy floor plan, you’re sure to have the time of your life with all of your family and friends. 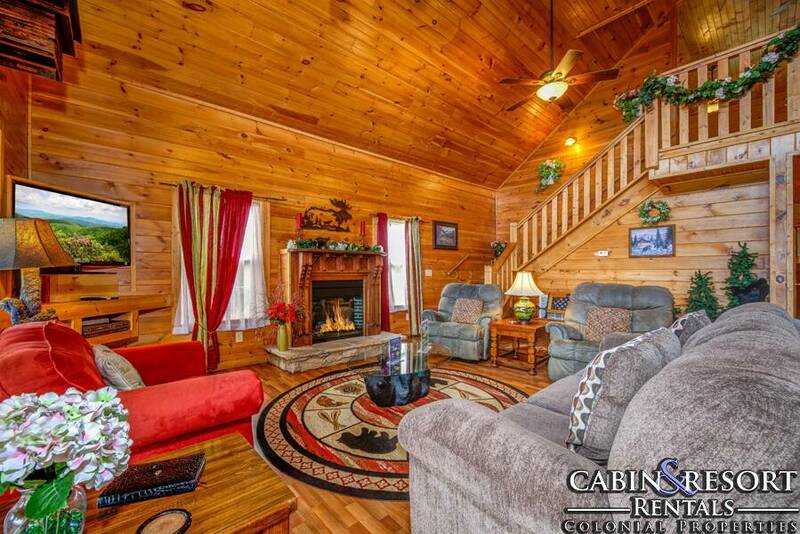 The spacious living room features a cozy fireplace, brand new furniture, TV and access onto the front covered deck. Adjoining the living area is the fully equipped kitchen. 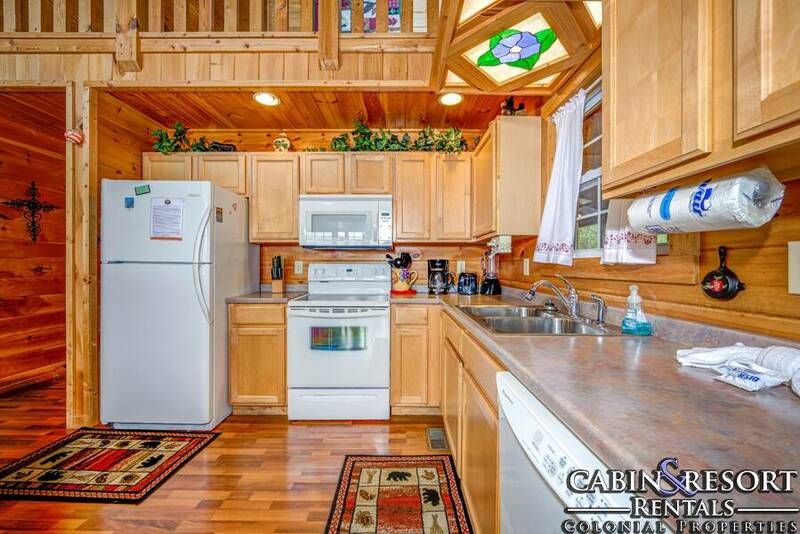 With modern appliances and all of the necessary utensils to prepare a delicious meal, you’ll be able to serve everyone their favorite foods while staying at Cabin T. Sit down and enjoy some quality time with your guests at the nearby dining table that can accommodate up to 6 people. In the kitchen area, there is also a breakfast bar with additional seating options. Take a trip upstairs and you’ll enter the game room. 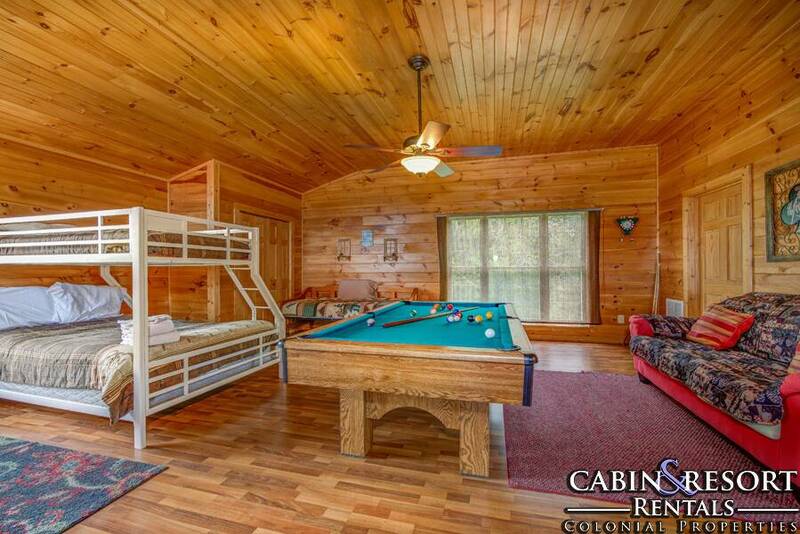 With a pool table, bunk beds, and a half bath, you’ll be able to keep everyone smiling, laughing and entertained while staying in this amazing cabin. Cabin T also offers a twin size daybed for additional sleeping space. 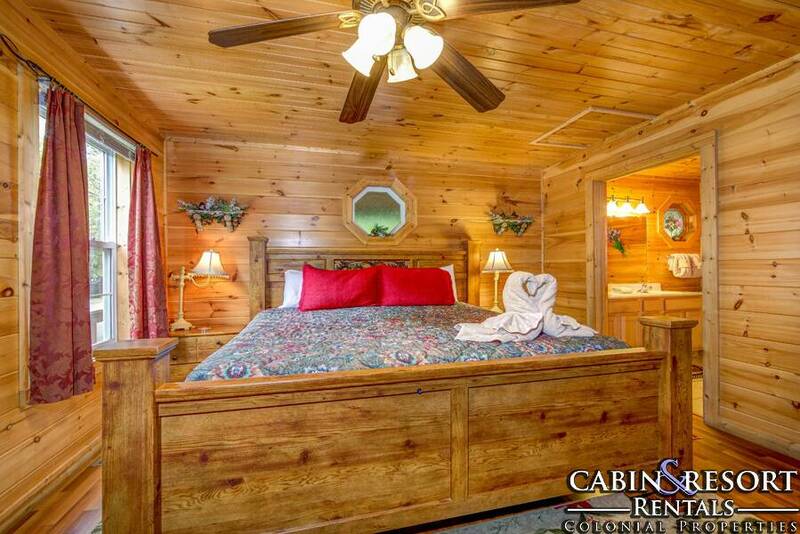 Located on the main level of Cabin T is the super relaxing king bed master suite. After a day of sight-seeing in the Smokies, walking around downtown, riding the coasters at Dollywood or shopping at the mall, you’ll be able to return here and catch up on some much needed rest while you’re on vacation. The master bedroom also features an in-suite full bath with double sinks for added convenience. 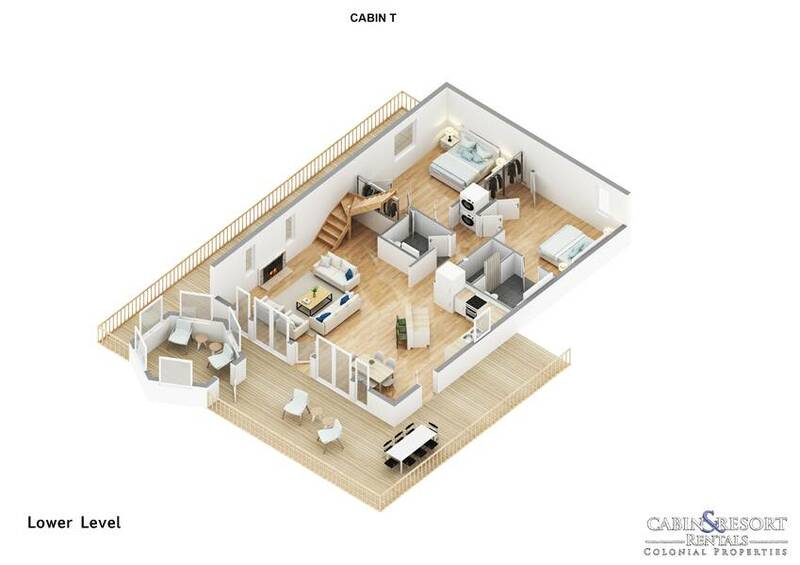 You’ll also find the second bedroom at Cabin T located on the main level. This queen bed suite is beautifully decorated and has access to the additional full bath. 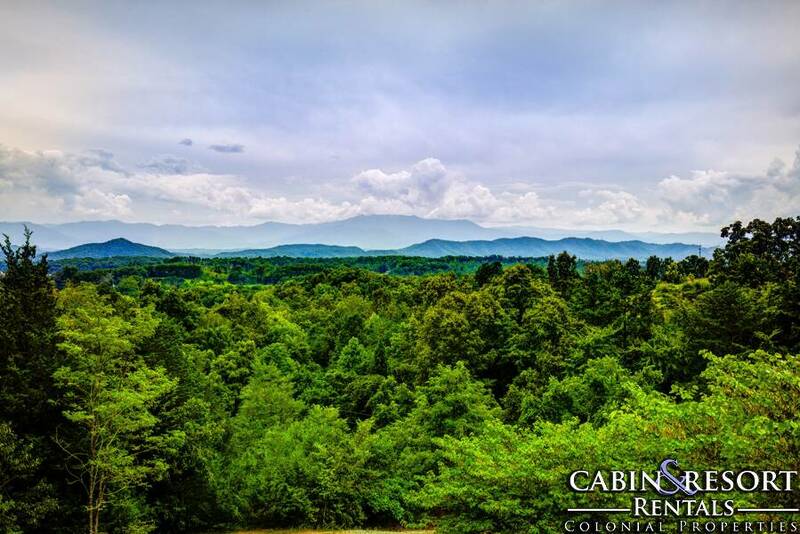 If you’re a nature enthusiast, then you’re going to love your stay at Cabin T. It’s quiet, private and serene setting allows you to enjoy the great outdoors and marvel at the breathtaking Smoky Mountain views. 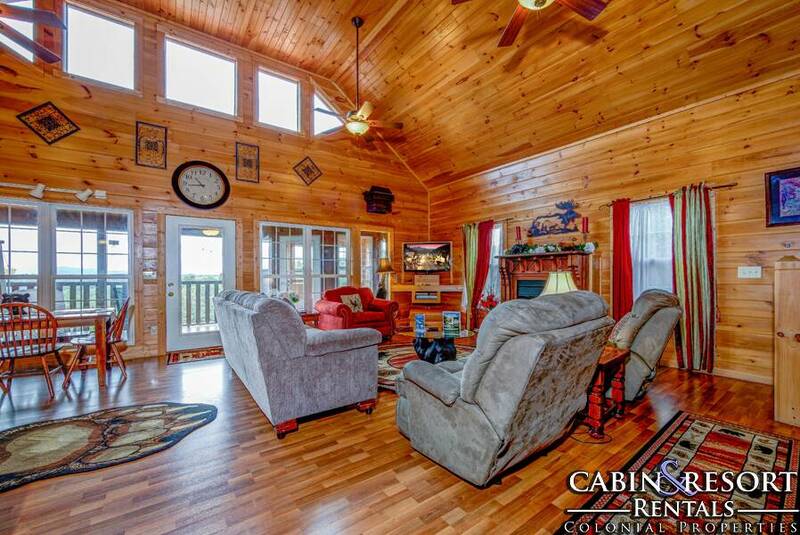 Cabin T features a full length screened porch – perfect for sitting back and enjoying a relaxing evening in the Smokies. Soothe your aches and pains and let your worries and cares disappear while soaking in the bubbling hot tub located on the screened porch. 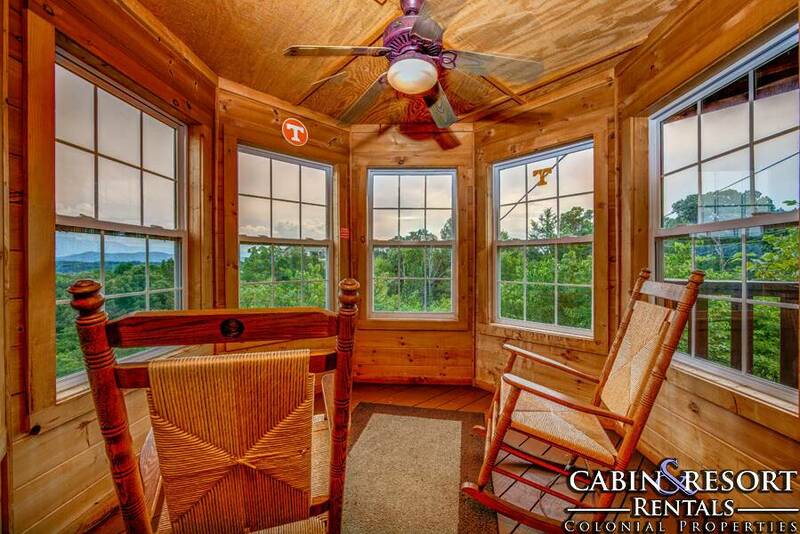 One of the neatest features of Cabin T is the outdoor enclosed meditation/reading room. 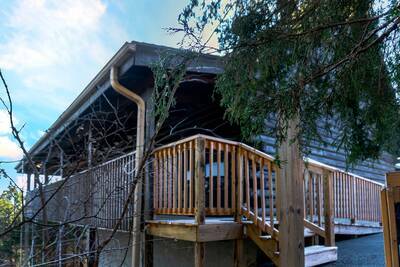 Here you can enjoy the panoramic views of the Smoky Mountains anytime of the year – no matter what the weather may be. 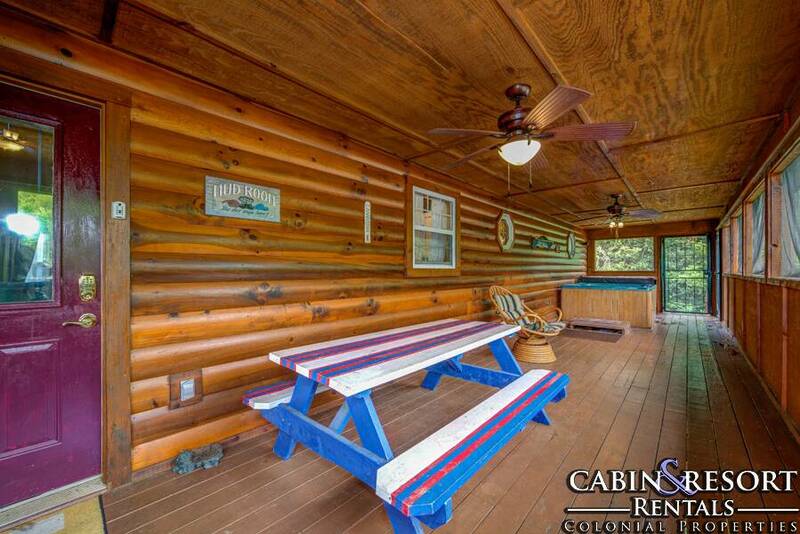 Cabin T also features a covered front porch with additional seating. 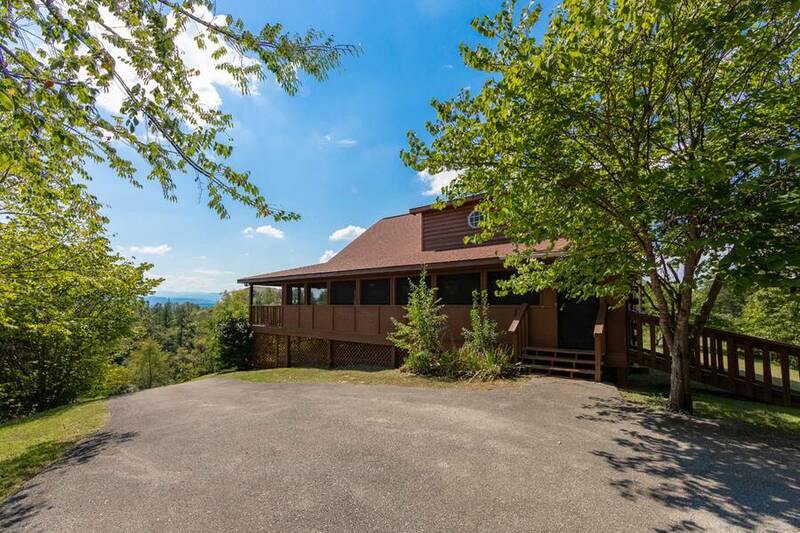 With all of the wonderful outdoor space at this beautiful cabin, you’ll have a chance to reconnect with Mother Nature and take in some much needed fresh Smoky Mountain air. 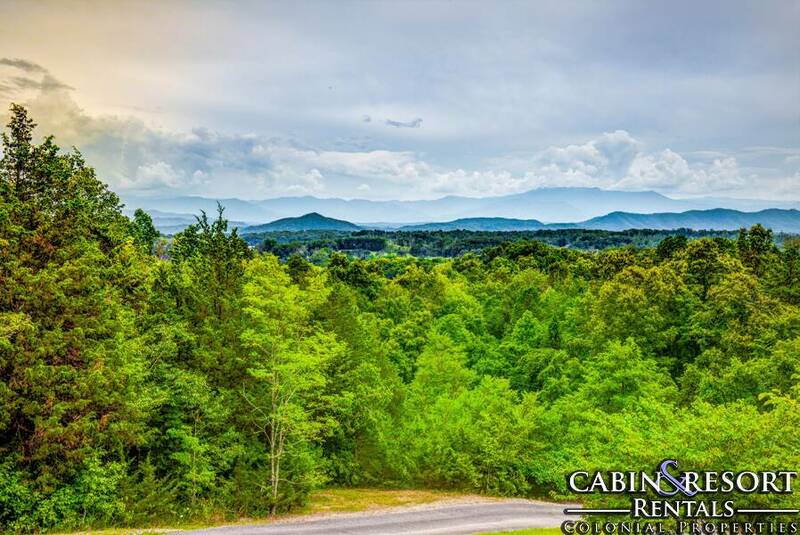 With countless features, amenities, beautiful landscaping and such a phenomenal view, you’re going to love every minute of your vacation at Cabin T. Contact us today to plan your mountain escape at this gorgeous cabin rental. A: Hi Francheska, unfortunately internet is not available for this cabin at this time. 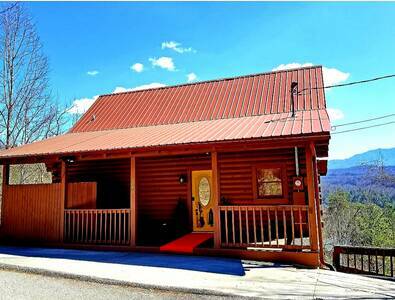 A: Approximately 20-30 minutes to Pigeon Forge and Gatlinburg. A: Internet is not available at this time. A: Hi Crisa! Yes, Cabin T is wheelchair accessible. A: Hi Allan! No, this is not a pet friendly property. 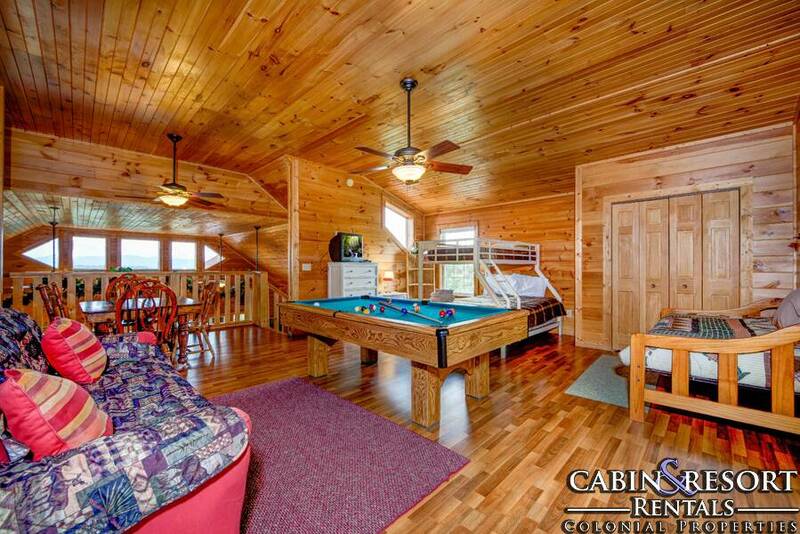 A: Yes, this cabin has a Washer & Dryer. 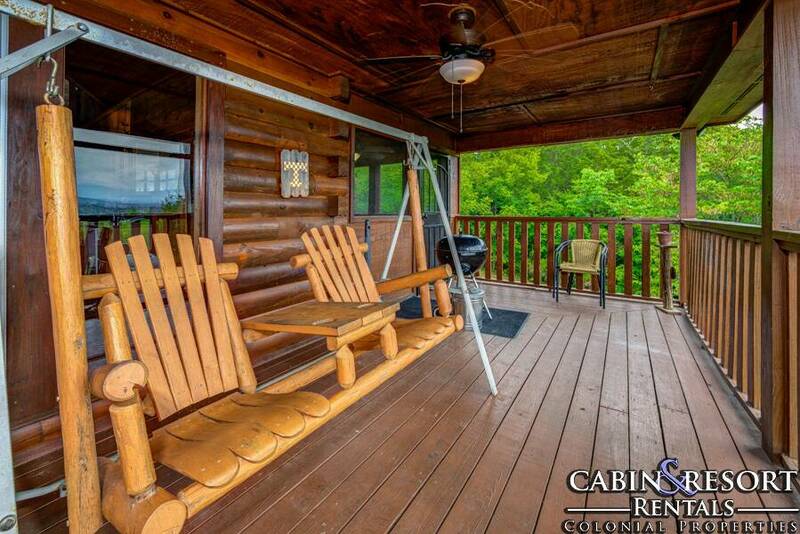 “ Beautiful cabin,great views,close to attractions. 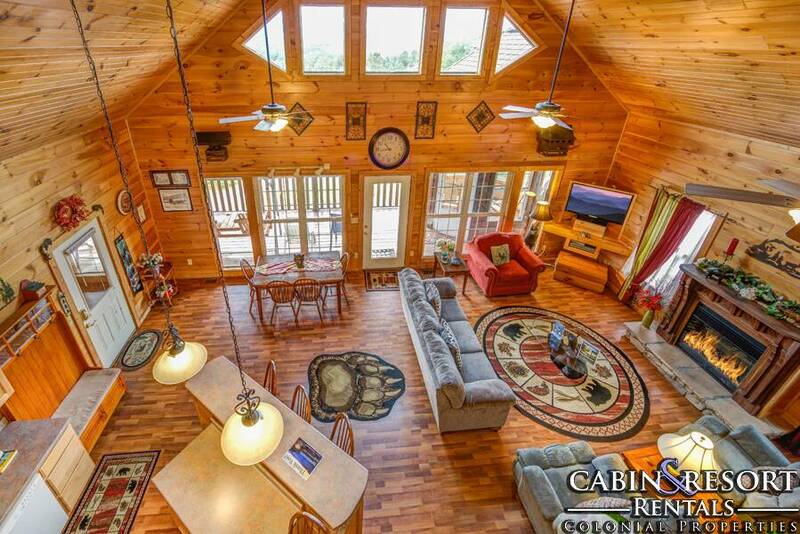 “ We have been to cabin twice now and love it! 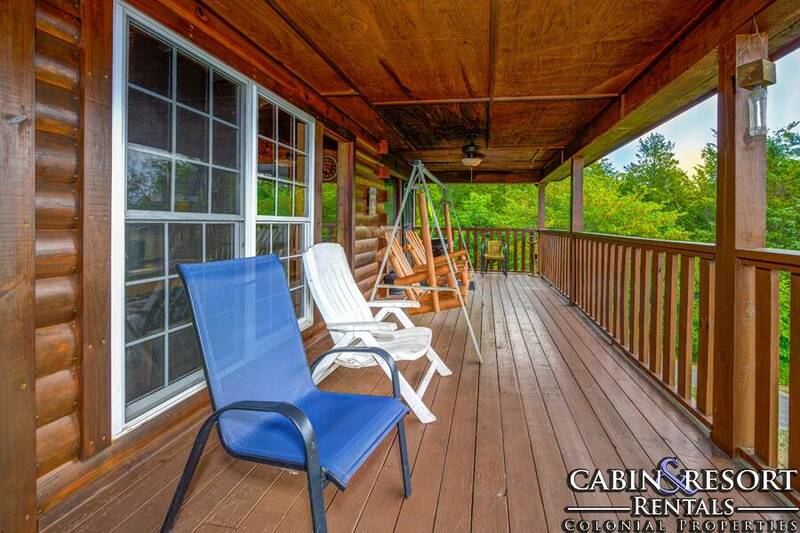 “ I really enjoyed Cabin T. It was nice to relax and enjoy the view from the balcony in the evenings. One night I heard an Owl outside, I enjoyed the Mountain View, the city lights from afar, and the comfort of having plenty of space to relax. I was disappointed when I realized that I didn’t have WiFi but the break from the internet was nice! 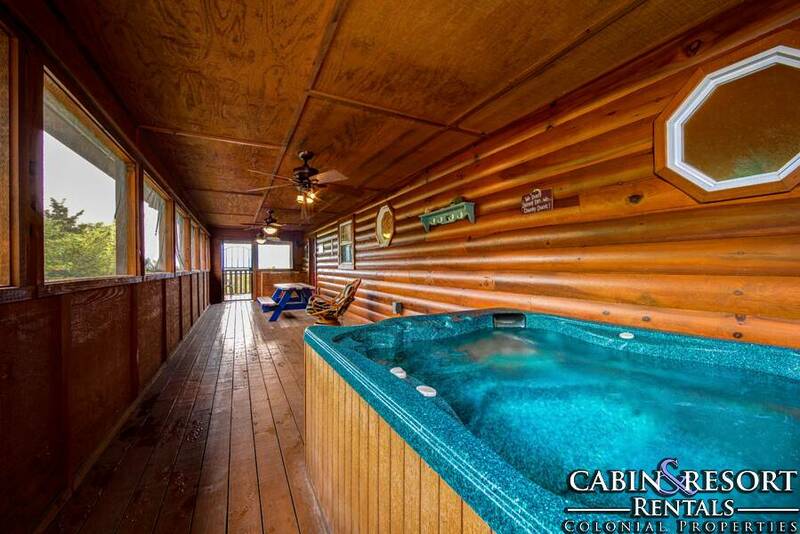 “ Our stay at Cabin T was wonderful!! We recommended it to our family and friends. The cabin was very clean, comfortable and very roomy. Very quiet place to stay. There are places nearby to eat out, food stores and gas stations. The Autumn view was a sight to see! The cabin made you feel right at home. 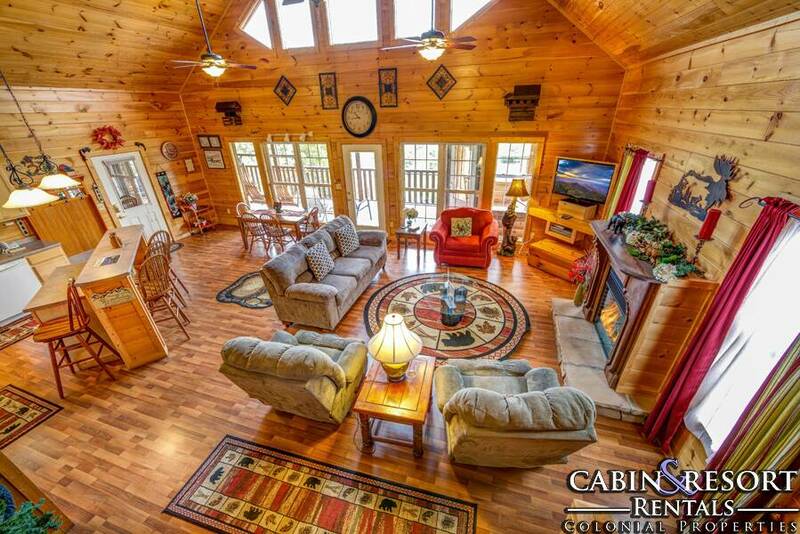 I hope this cabin is available next time we return to Pigeon Forge. A great place for a couple or a family with kids. 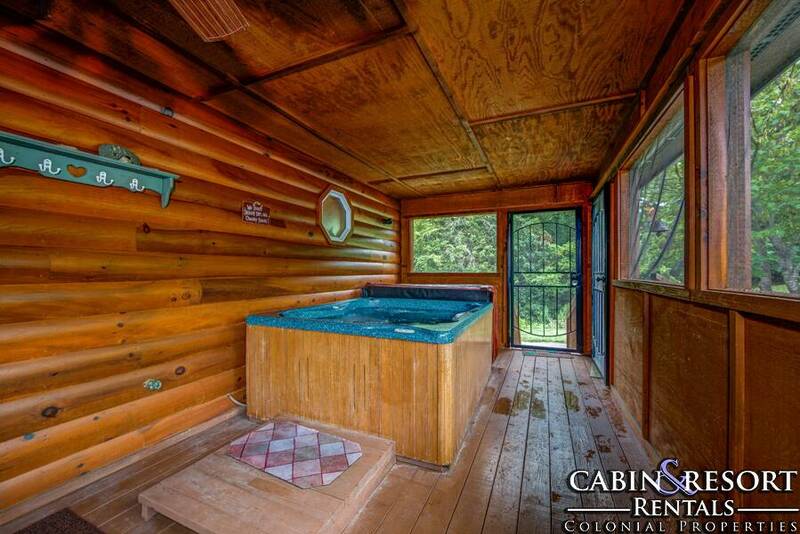 Colonial Properties is all that they say they are when you stay at one of their cabins. “ We needed the special time away to gather our thoughts. To experience what a little piece of Heaven on Earth is like. It worked out very well, he proposed all over again with the privacy of just the two of us. 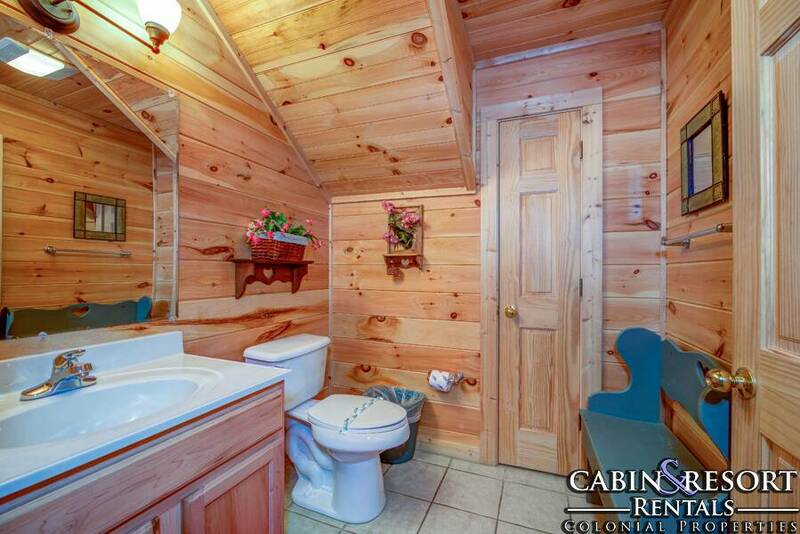 If you ever doubt your love for one another, visit Cabin T or any property Colonial Properties has to offer, and I assure you it will not be a disappointment. Thank you for the opportunity to stay in such a friendly environment. 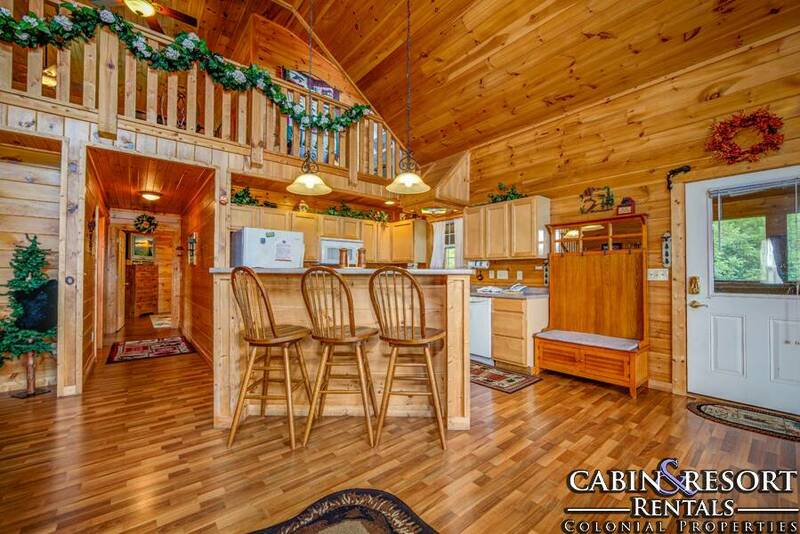 “ We absolutely loved the cabin! “ With a family of six kids and 2 adults, sometimes it is very hard to find a place big enough that is nice and convenient. We had the best time in Cabin T. It was beautiful and the kids had plenty of space. It was so nice after a long day of sight-seeing to be able to come back to the cabin and relax and not worry about listening to other people all night. We will certainly stay again, for our next vacation to the Smokies. Thanks to all the staff for making our family vacation great! 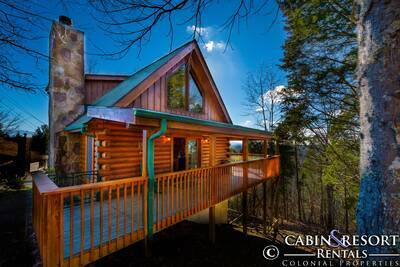 “ We thoroughly enjoyed our stay at Cabin T. The panoramic views were absolutely spectacular. It offered the ultimate in privacy and was perfect for our family vacation. The interior was tastefully decorated and spacious enough to accommodate a large number of guests. The handicap access was also helpful as was the downstairs master bedroom. We spent time watching deer on the wrap-around porch and settled in at night to watch movies. The kitchen was well-equipped and meals were easily prepared. The clean up was easy because of the dishwasher. All in all it was a lovely vacation. “ Very beautiful cabin. Well worth the price. 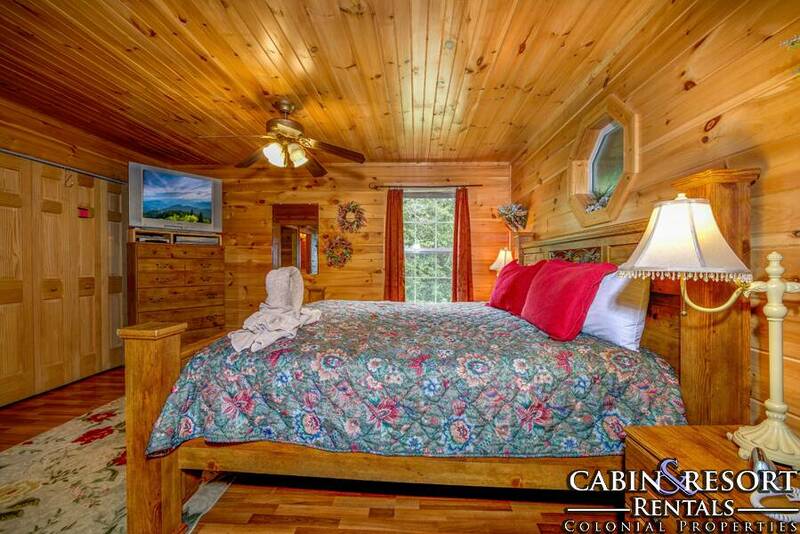 I would recommend others to stay at Colonial Properties Cabin & Resort Rentals. 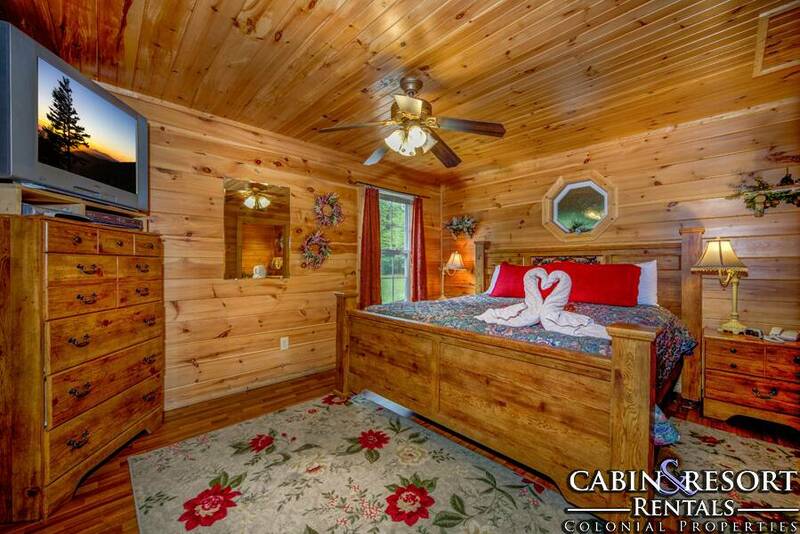 “ If you want privacy, Cabin T is by far the best cabin we have stayed in. 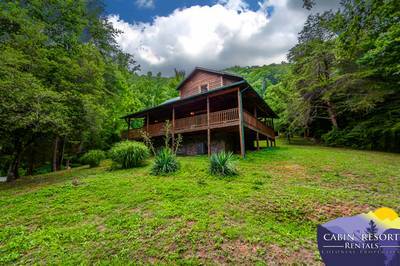 If you are looking for a place that is so quiet that all you hear when sitting on the front porch is crickets; this is the perfect cabin. We will be coming back to Cabin T!! “ Great View. 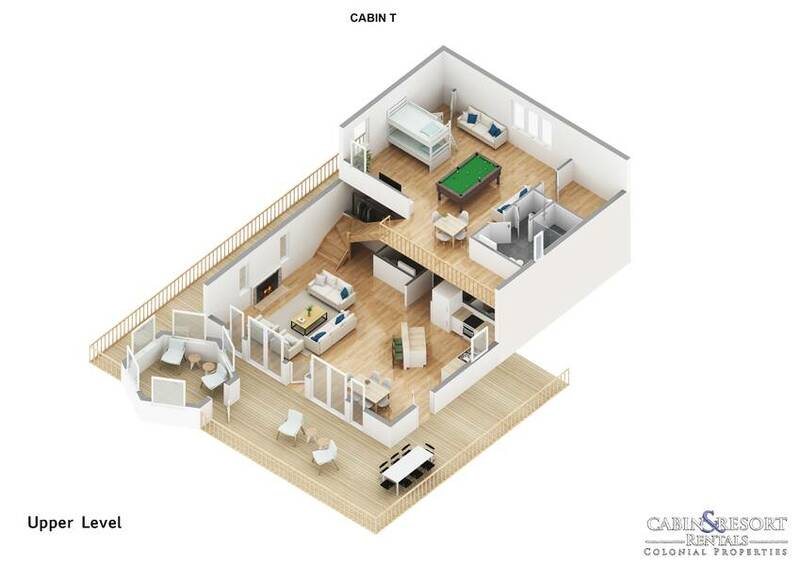 The cabin has a very nice floor plan. Large bedrooms and dining area. We really enjoyed the deck area with the enclosed reading room. Will stay at this location again next year during the fall season. “ This cabin is definitely one that we would consider in the future. The view was awesome, the area was very quiet, and the abundant wildlife an added pleasure. 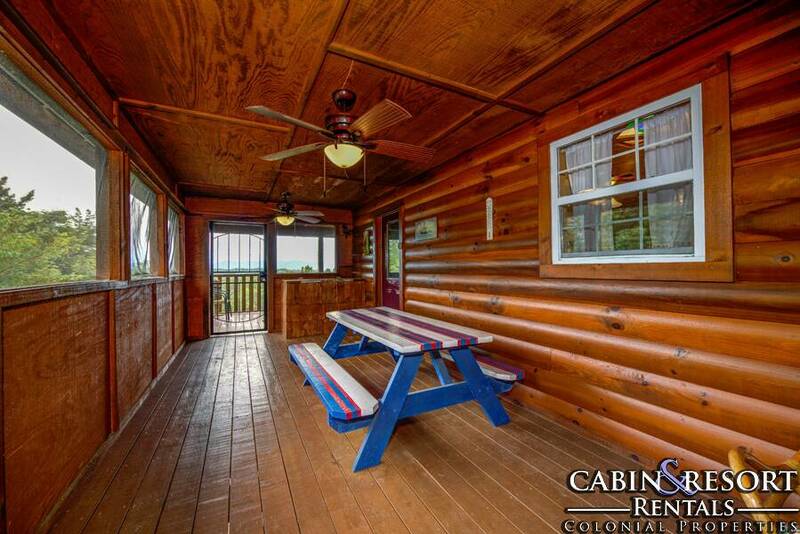 “ Very nice cabin, great views and close to everything. We had no problems but the driveway to cabin could be tricky in snow and/or especially icy conditions. Would definitely recommend to friends and family. “ Very nice place to stay. It was quiet and very relaxing. “ Very nice cabin. It was so private that we felt like we were in our own little world. “ Cabin T was the best cabin we have rented yet. The best part was there were no other cabins on top of you!! Very Private!! 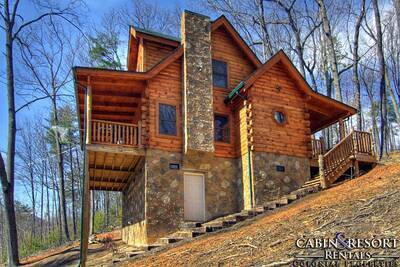 We will only be renting Cabin T for all future visits!! 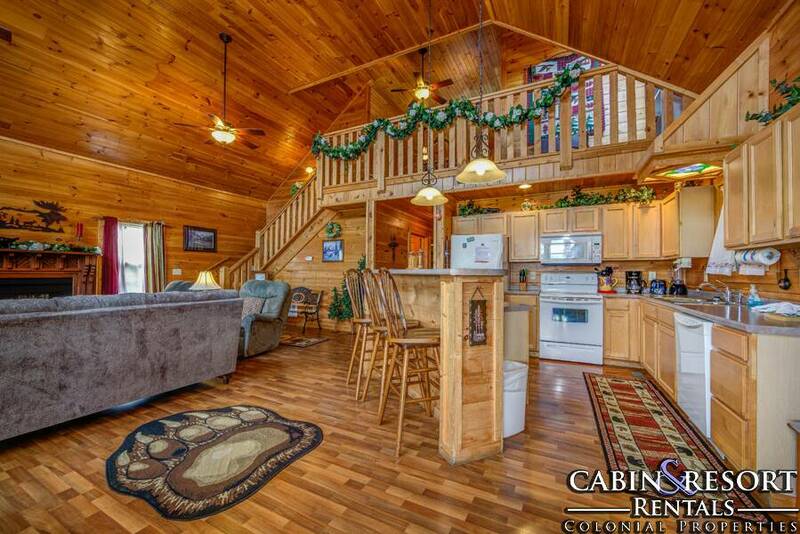 “ Cabin T is the nicest cabin we have ever stayed in. We like the location. The room for parking was great for my husband's boat. The upstairs room was great for the kids. The decor was really nice also. We will definitely stay in this cabin in the future. “ We had a great time. The cabin is very spacious, awesome view and a good price. Great when you have children and children are able to play outside without danger. If you like privacy, view and space, this is the one. 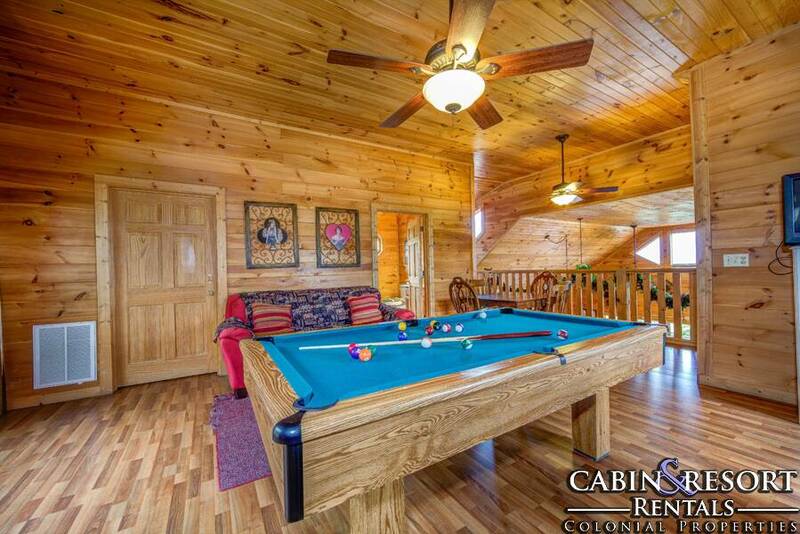 “ Our second visit to Cabin T just confirmed how awesome it is. It fits our family of 6 perfectly. 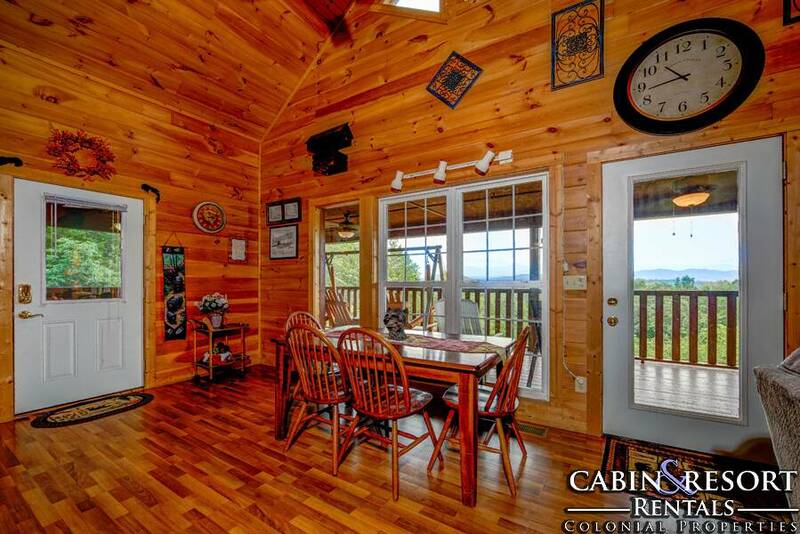 We love the privacy that this cabin provides, yet is only 15 minutes from serious shopping. We have not found a cabin with this much privacy and such an awesome view. 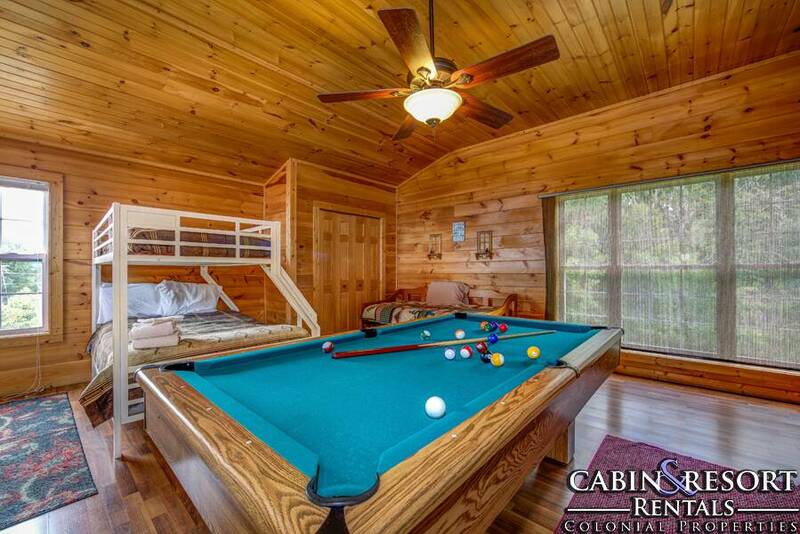 We will definitely revisit Cabin T when in TN. “ Great experience!! Looking forward to our next trip. Great location and excellent deal! Will be booking with Colonial Properties again!! 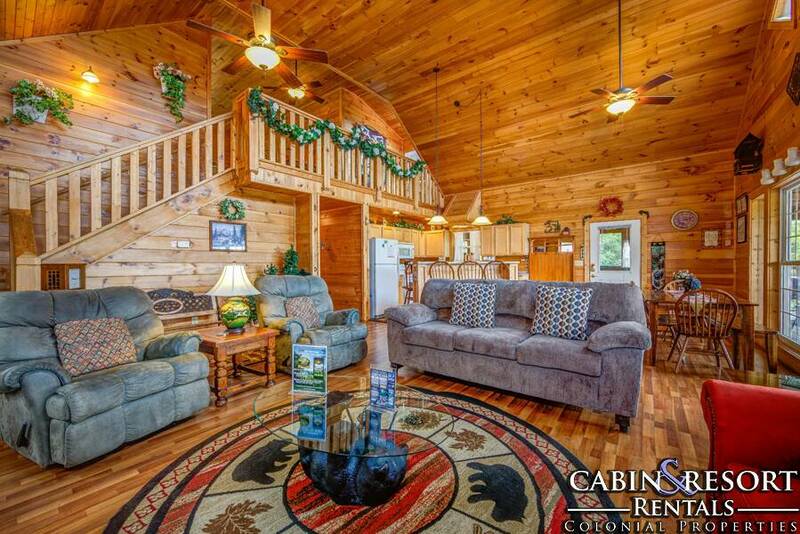 “ The cabin is wonderful and view is terrific. 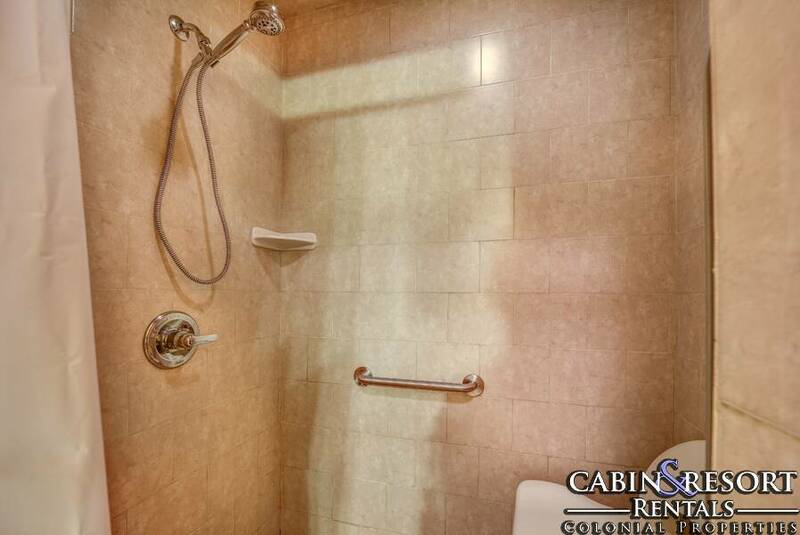 “ Cabin T was definitely more than we expected. It is an awesome cabin with an awesome view. 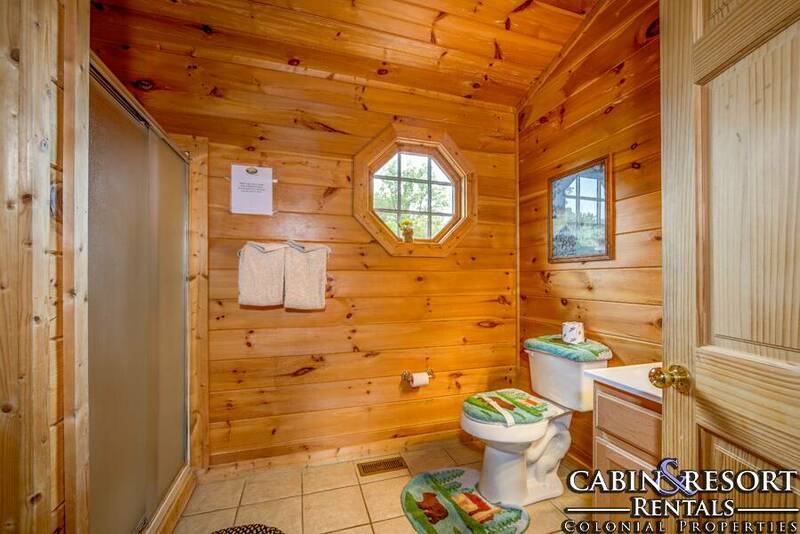 The cabin is definitely a one of a kind. Nice private location. Will definitely stay there again. “ We all really enjoyed our stay, cabin was beautiful, peaceful and the view was great. 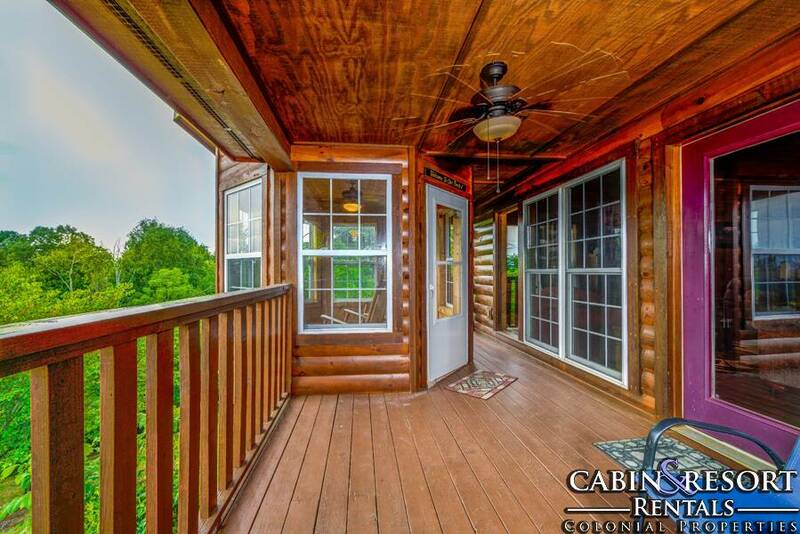 “ View was tremendous, inside of cabin was terrific also. Bedrooms were roomy and also comfortable. “ Enjoyed the location and the cabin. 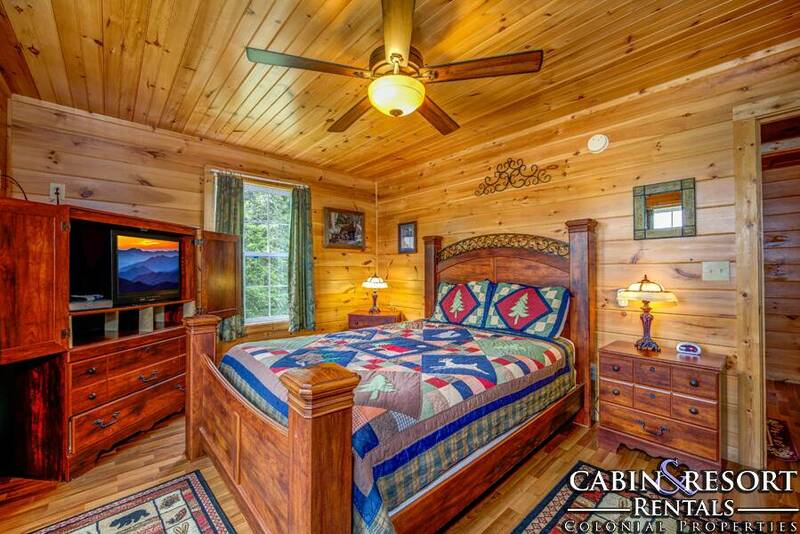 “ The cabin was very clean and beautifully decorated. The view was excellent and everything in the cabin was easy to find and operate. “ Excellent cabin! Colonial was great to deal with! “ This was a new cabin for us and it worked great. Plenty of room for our family of five and secluded the way we want a break from the craziness of life, but close enough to endulge in the tourist trappings of the area. The folks at Colonial Properties went out of their way for me when some business issues popped up and I needed some help. Forgive me for not remembering other names, but Amy and Josh were extremely helpful when I went to their offices and was able to sign a business contract and sent it out. Both the cabin and the company are phenominal. This is probably our 5th time renting through them and we won't bother looking elsewhere when we inevitably return to the area. Love it! 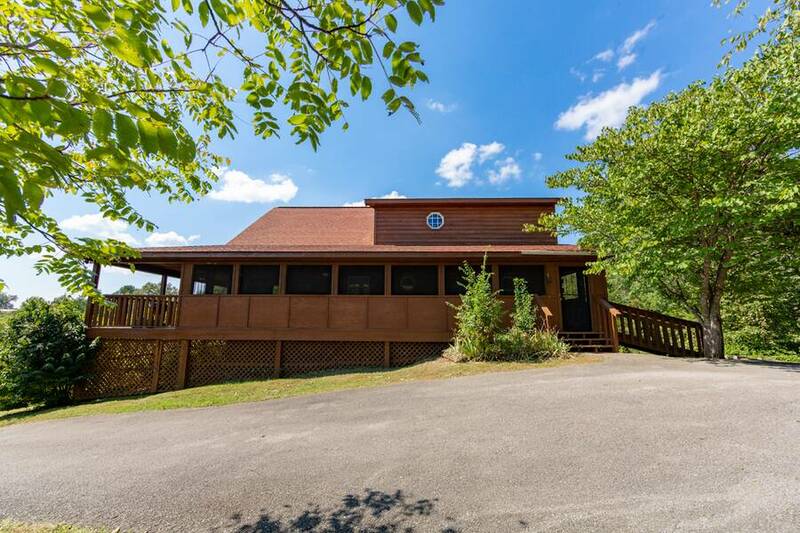 “ My mother, sister and my self stayed here for the weekend we loved the cabin and the staff at the office was very friendly and helpful We look forward to staying in more cabins in the future. “ Had a wonderful time. My mother and mother in law loved the "little room" on the deck for coffee in the morning and drinks at night. The cabin was very private, but yet only about 15 minutes to town. We had everything we needed for cooking and serving dinner at the cabin. Having the stacked washer and dryer tucked in a small closet was also wonderful. 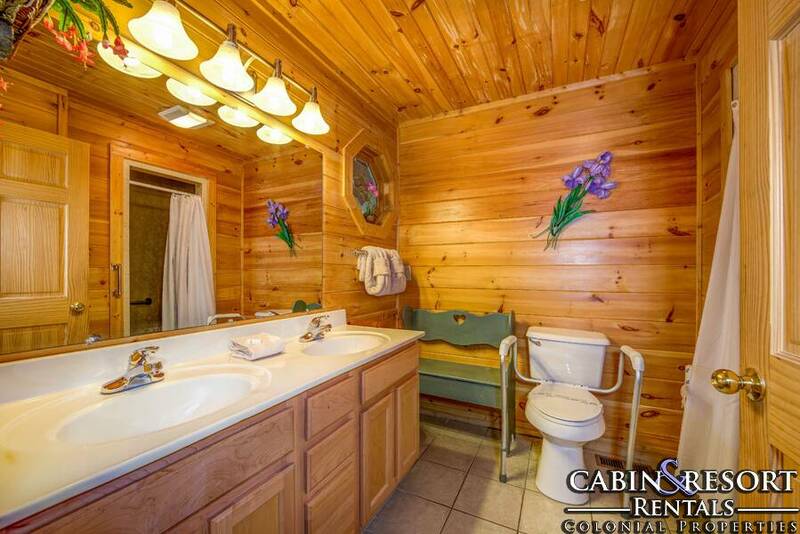 My mother in law, who is 86, was very relieved to see that the cabin was handicap friendly. Thank you for a wonderful stay. “ Cabin was beautiful and we'll taken care of. The view was amazing and close to stores if needed. We would come back to stay at this lovely cabin again. “ We drove from Virginia to Pigeon Forge to meet family who came in from Alabama. 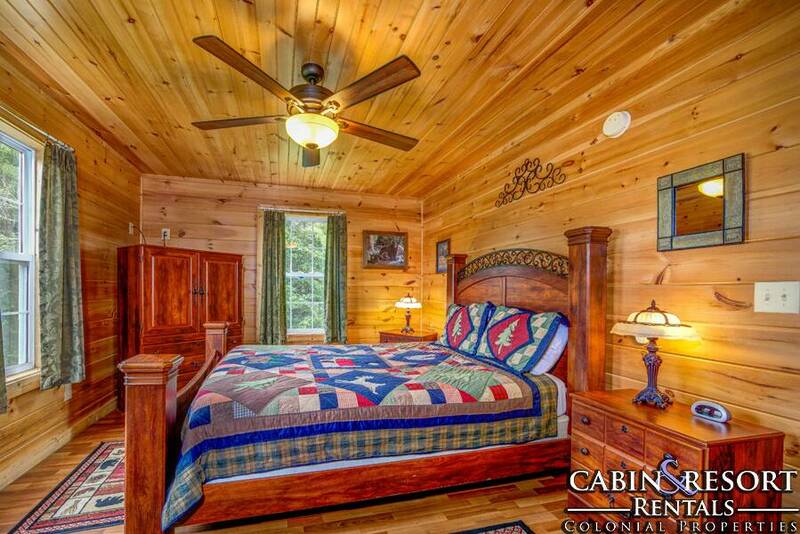 I have never felt more comfortable and at home as I did at Cabin T and with Colonial Properties! It was one of the best weekend getaways we have had and being in the cabin was absolutely wonderful! The view, location, and activities in the area were amazing! We loved it there and will be going back in the future!!!! There is so much to do and everything is minutes away! We couldn't have asked for a better time!